Dan has spent his entire career in the security business. He launched Hogan Security Group more than three decades ago, and has grown the business based on an unwavering commitment to customer satisfaction, good working relationships with vendors and partners, a focus on bringing the latest industry innovations to his customers to meet their new and evolving needs, and The Golden Rule for all, at all times. Angela Leaney is the CEO of Hogan Security Group. Her expertise is in defining and building growth trajectories for new and established brands and organizations, in multiple verticals. Angela’s career has been a one of "firsts.” She is the first female CEO of Hogan Security Group, was the first CMO of Newsweek, first Creative Director of Nickelodeon preschool & parents, first SVP Brand Communications of Nickelodeon’s digital channels and first Account Planning Partner of Ogilvy & Mather LA. In addition to her corporate responsibilities, she serves as a mentor and advisor to emerging leaders and start-ups, is a member of the advisory board of VStar Entertainment Group, and active member of the General Advisory Committee of Mercer County Technical Schools, MID Jersey Chamber of Commerce, NJCCTVS, NSBA, and recently secured Hogan Security Group's position as the first and only security company on the NJSBDC Sustainable Business Registry. "Until people can walk through walls, they need doors that function well. Doors matter! They enable freedom of movement, secure property, and engender a feeling of safety for kids, staff, employees, occupants, guests at the facility. They play a critical role in keeping danger at bay. I am so proud of our unbelievably talented and professional team at Hogan Security Group, who focus on solving problems and keeping people safe. We spend every day working on sustainable solutions to our clients' problems. That is a privilege." 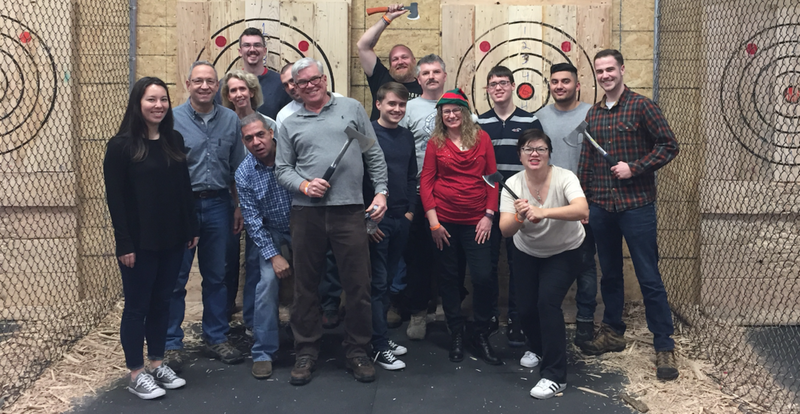 The team relaxing throwing razor-sharp axes in our spare time. Safety-first, of course!